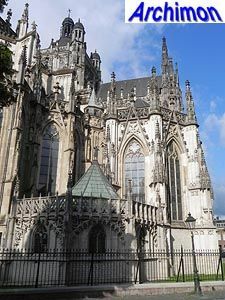 Without a doubt one of the most important monuments in The Netherlands, and the most important example of Gothic architecture, is the St. Janskathedraal, or St. John's Cathedral. 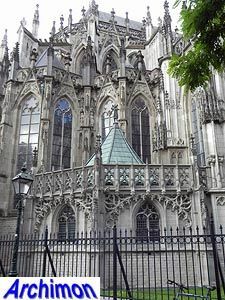 It's also a symbol of the catholic revival in the 19th century, and until well into the 20th century was a symbol of catholic pride, appearing on posters of all kinds of catholic organizations. 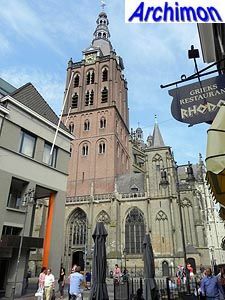 Although it looks very much like a true archetypal cathedral, both in style and size, the St. Jan (St. John) originally was intended to become the city's first parish church. 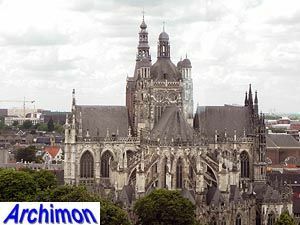 Until then the people of 's-Hertogenbosch frequented the church in nearby Orthen, a village that has been incorporated in 's-Hertogenbosch long since. 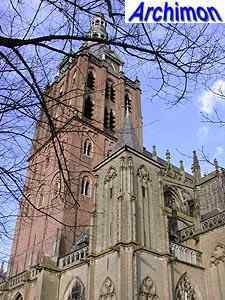 The St. Jan is first mentioned in 1222. 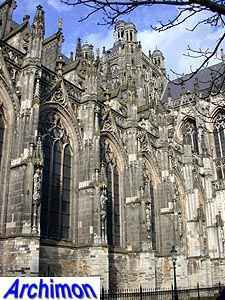 In that time it was still a Romanesque church, standing outside the city's walls. 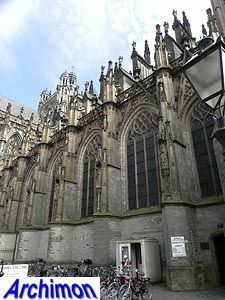 In the centuries that followed most of the old church would be replaced by the currentGothic building. 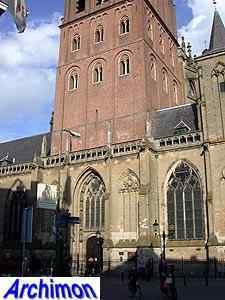 Of the original church only the tower and the adjacent chapels remain. 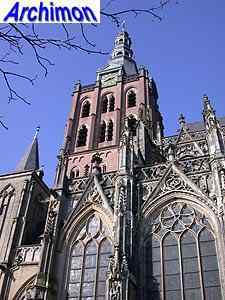 Instead of replacing it the tower was heightened with a new upper segment in a moderate Gothic style, and a spire. 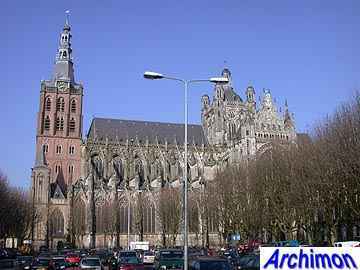 The difference in style between the Romanesque front and the flamboyant Gothic church is obvious. 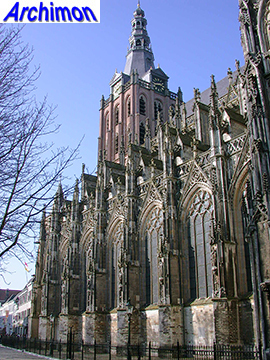 After the church was returned to the catholics, the plans to finish it with a new neo-Gothic tower soon returned. 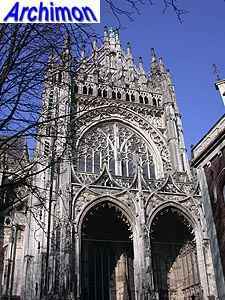 They never came true, although the Romanesque style was hidden during one of the restorations. 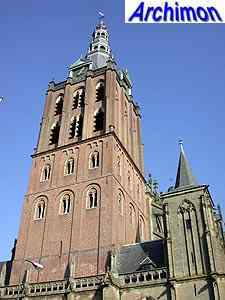 Between 1975 and 1982 the lower segment of the tower was reconstructed back to its old state, but because of the new coat of brick this oldest part of the church now looks like it's the youngest. 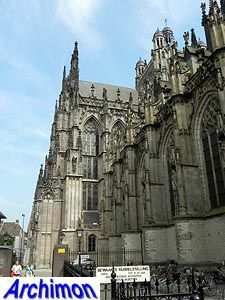 The construction of the Gothic rest of the church lasted from the second half of the 14th century until the first decades of the 16th century. 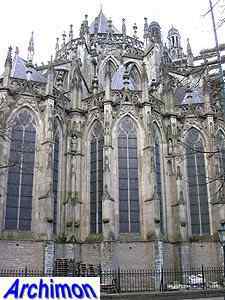 The nave is five aisled wide. 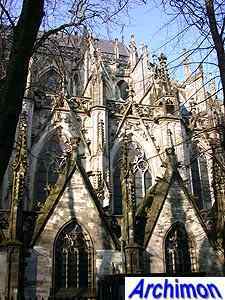 The choir has an ambulatory. 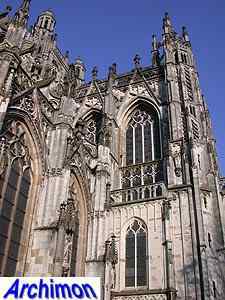 The facade of the southern transept-arm could be a fine example of flamboyant Gothicism. 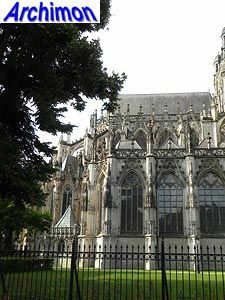 Unfortunately it is uncertain whether it's original or a reconstruction dating from one of the restorations, based on remains the extent of which is unknown. 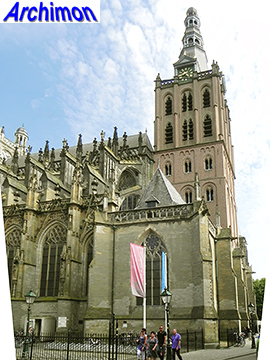 A tall wooden tower was put on the crossing in 1529 but in 1584 this was destroyed by lightning. 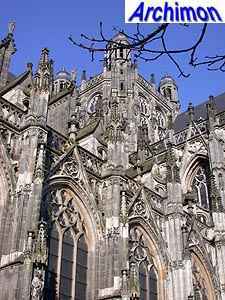 Only the stone lower segment remains, with a dome-like spire. 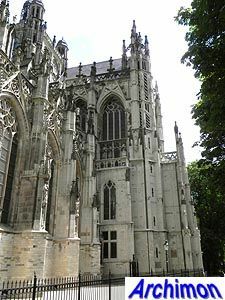 The tower was changed to its current look in the 17th century, and shows Renaissance influences in its windows. 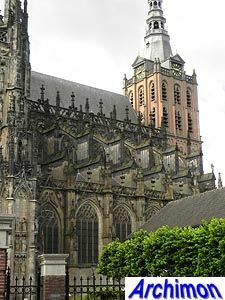 In 1559, a few decades after it was finished, the church became the cathedral of the newly established diocese of 's-Hertogenbosch, until in 1629 the calvinists under the leadership of prince Frederik Hendrik van Oranje-Nassau conquered 's-Hertogenbosch, ended all catholic religious activity in the city and handed the St. Jan over to the handful of protestants that lived there or had followed the army. 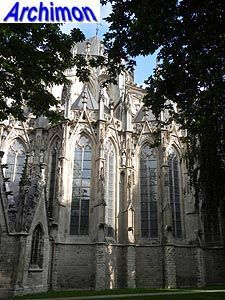 In the centuries that followed the building was shamefully neglected, and when Napoleon, during a visit to the city in 1810, returned the church to its rightful owners, intensive restoration was needed. 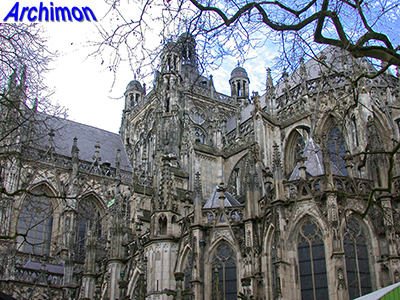 It would last until 1858 before a start was finally made and it wasn't until 1985 that the restoration was finished. 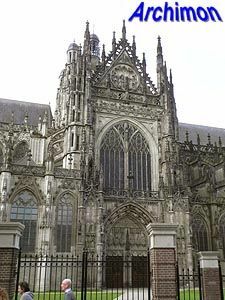 During this long process countless mistakes had been made, one of the biggest of which must be the sale of the organ-loft from 1613 to the Victoria and Albertmuseum in London. 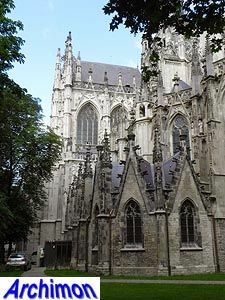 Among the other mistakes were the use of inferior natural-stone (which already had to be replaced within the century), the excessive addition of statues to places where there never had been any and, generally, the many changes that altered the St. Jan's identity as a true example of Brabantine Gothic (Brabantse Gothiek, see Gothic), the duchy's own variant of Gothicism. The biggest mistake, the solving of which cost around 30 million US Dollar and many more years, was the use of iron clamps to secure the statues in the stone. 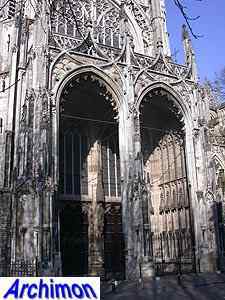 These began to rust and forced the stones out of place, many of which crumbled under the pressure.